Aquamite Pumps are made from a one-piece moulded body which is strong, durable and non-corrosive. This simplistic form of construction makes for not only quiet operation, but also affords ease of maintenance and servicing. The Aquamite pump has proved to be a real success within the Koi Industry. 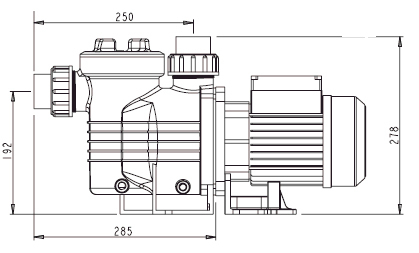 The most compact pump in the pump range, it is available from 0.33hp to 1.25hp. The Aquamite pump’s impeller and diffuser design maximises the hydraulic output and minimises turbulence. The efficient performance of this pump means shorter run times and therefore reduces energy consumption leading to lower operating costs. The pump body is manufactured using state of the art engineering plastic moulding with a single piece strainer pot and volute for extra strength. An additional unique secondary seal protects the motor end shield from any fluid contact, eliminating corrosion to the motor end shield.